Joseph Mallozzi's Weblog: June 28, 2009: WTF? I’m on! I’m off! I’m back on again! Discovering the inner me! And catching up with the mailbag! June 28, 2009: WTF? I’m on! I’m off! I’m back on again! Discovering the inner me! And catching up with the mailbag! I could’ve sworn I uploaded this entry a couple of hours ago but when I cruised by to check on comments, it had magically disappeared. Or maybe it never appeared in the first place. Hmmm. Okay, let’s try this again. For as long as it took me to throw on a pair of jeans, grab my camera, and hop in the car. For lunch, I enjoyed a ½ kilo of that spit-roasted lamb, a Greek salad (to placate my guilty conscience. Tomatoes are chalk full of lycopenes! ), the loukoumades (deep-fried dough soaked in honey and cinnamon and sprinkled with sesame seeds), and THE most cloying dessert imaginable – baklava (layered pastry dough with nuts soaked in honey). I know, I know. It seems like an excess amount of food but, keep in mind, I had the full kilo of lamb last year. Also, it was my great meal because I am now absolutely, without a doubt, no excuses, REALLY “on the program”. Unless, of course, I can convince the gang at work to make the five minute drive over to Boundary for lunch. Greek fest continues all this week. First up, I answered the age-old question that has plagued man from the dawn of humanity: “Do you shop more than most women?” (http://www.blogthings.com/doyoushopmorethanmostwomenquiz/). According to the scientific study, I am a window shopper who who rarely gives into impulse buys but has a nice wardrobe. Moving on, the next quiz afforded me the opportunity to answer a question that I’ve been wondering for a while now: “Which Victoria’s Secret Angel are you?” (http://www.blogthings.com/whichvictoriassecretangelareyouquiz/). Well, apparently, the data suggests I am most like Laetitia Casta. And finally, just this morning I was asking myself “What kind of lip gloss should you wear?” (http://www.blogthings.com/whatcolorlipglossshouldyouwearquiz/). The results: mauve. Smart, polished, and pretty. Today’s entry is dedicated to birthday gal Luvnjack. Answer: Although I’ve yet to hear of an official date, my understanding is that Stargate: Universe will premiere in early October. Still no word on the production dates for either the SG-1 or the Atlantis movie, however, we have received some preliminary feedback on the first draft of Extinction. Answer: From who? Since I co-wrote the script, I’m in a better position to know which characters will be making an appearance – all of them. Pastrygirl writes: “Do I remember correctly that Destiny is supposed to be an Ancient class ship? Like the one that Rodney got working on the volcano-riddled planet? Answer: Sorry. For the details on the ship and the gate, you’ll either have to wait for the studio to release the visuals or hold out until the premiere. PG15 also writes: “I wanted to add a thank you for these short “profiles” on the cast members! First Jamil, now Brian. It’s great to get to know them a bit before seeing them on the screen, dazzling us with their talent. Answer: Remind me closer to the date. Major D. Davis also writes: “1. You already know my reasoning, so is episode 19’s title is hope? Answers: 1. Nope. 2. Yep. 3. No idea. 4. At first they can be, simple place holders designed to convey a sense of how the sequence will unfold. Answer: Baal’s ultimate fate will remain unknown for the time being. Sorry to say he won’t be making an appearance in the SG-1 movie. JJ writes: “Did you know who will go to Comic-Con this year? Answer: I won’t be going this year but Brad Wright, Robert Cooper, and almost the entire cast will be there. Answer: It may make someone more likely to read you, but being a journalist doesn’t give you a leg up on landing a staff position. It all comes down to the quality of that script. Answer: Singing, dancing, and over-the-top acting performances reminiscent of the overly-enthusiastic actors in children’s programming. Do away with those, the crowds, and the uncomfortable seats and I’d like it just fine. Answer: They taste like deep-fried pork. It is pig’s feet though, for the dish, I believe the actual meet is stripped from the trotter before being prepared. Answer: Squash-stuffed agnolotti with black truffle butter. Answer: Uh, no. Definitely not. That would go against everything I hold dear and believe in. Answer: Tune in and find out! Answer: Oh, sure. Occasionally, Rachel would tell me if she wasn’t up to having her picture taken and that was totally cool. However, it wasn’t until midway through season five when I was chatting with Jason Momoa that he told me a couple of cast members didn’t like having their photos taken. I was surprised, not because of their reticence, but because neither had bothered to say a word about it to me. After that conversation, I made it a point to have anyone I snapped sign off on their pics – while Jason would occasionally recruit ME for an impromptu photo op, like his infamous Cruise-esque couch-jumping shots (http://josephmallozzi.wordpress.com/2008/05/28/may-28-2008-major-retailer-recalls-combustible-underpants/) or his throwdown with Identity guest star Dawn Olivier (http://josephmallozzi.wordpress.com/2008/08/23/august-23-2008-questions-answers-guests-and-pics/). Damn, I miss the big guy. Anyway, that was the one and only time I heard an objection but, out of courtesy and just to be on the safe side, I now have the actors okay or nix their pics. At the end of the day, you want them to feel comfortable and know that you’re not going to let them look silly. Unless, of course, they want to look silly. Then, all the better! Previous Article June 27, 2009: Birthdays and Bon Voyage Dinner. Next Article June 29, 2009: Counting Down To The Summer Hiatus! David Blue! I haven’t had some good Greek food in ages. I recently tried goat which wasn’t bad at all. And Joe, I know you don’t do Facebook, but I’m sure you can find this quiz someplace else online: Which muppet are you? I got Statler and Waldorf. I love Baklava! Best dessert ever! I haven’t been around much lately, bad me, but I figured I’d pop by and see how things were going over here. Just wondering, have you ever read Hood by Stephen R. Lawhead? It is first in his King Raven Trilogy which is like a rewrite of the Robin Hood myth, very interesting and great characters, I’m currently reading it for the second time before I start on the second one called Scarlet. Also I am hoping Patrick Rothfuss’ release of Wise Man’s Fear doesn’t take too much longer, apparently the previously mentioned release date was wrong and wasn’t even when Pat thought it would be ready, Amazon or something just got it wrong. Hopefully it should be out sometime this year though. First, thank you for answering my questions. I see the wisdom in your decision to have actors sign off on photos. I can certainly imagine actors get tired of always having to be ‘on’ for the camera, and they probably cringe a little when they see Paparazzi Joe coming their way. And I miss Jason, too. I hope you’ve done something better with his character in the movie…his development fell flat in the second half of S5, and Ronon just went back to being a big goon. Jason deserves much better than that. Mmmmmm! I love Greek food! We have Greek friends who give us tubs of real feta (usually goat milk, but sometimes the coveted authentic sheep’s milk feta), and calamata olives. I have the most wonderful salads for weeks afterwards! And the lamb sounds delish! Finally a meal I could appreciate, too. 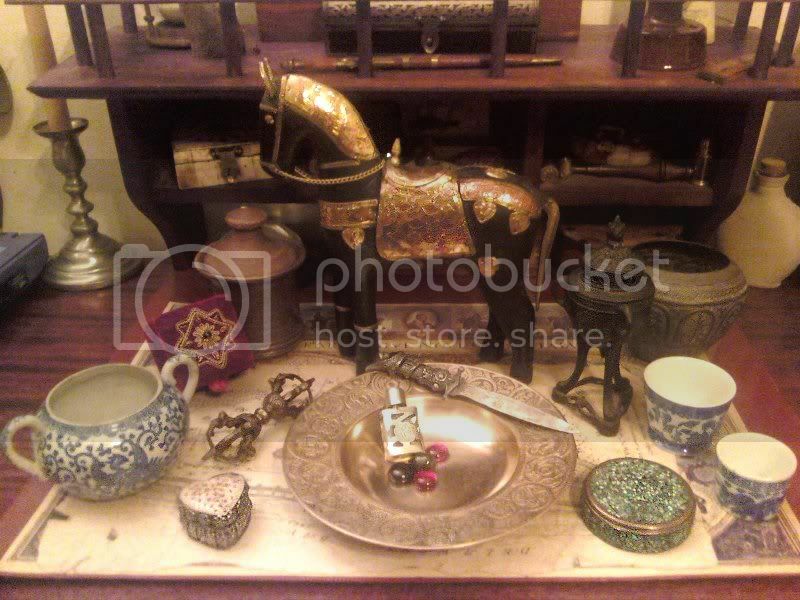 I will decorate with it – get rid of some old stuff to make room for this ‘new’ used stuff. Yup – I like crap, but not so much clothes. 3. Supposedly I should wear ‘cherry red’ lip gloss because it’s ‘wild, fresh, and totally alluring.’ I’ve worn cherry red lip color before, and it makes me look like a cheap, worn-out whore. THANK YOU for posting those links, Joe…they’ve totally convinced me that I shoulda been a dude. Wow Joe , that is scary. I got the same answers you did on the quizzes. We are just alike, except your a boy and I’m a girl. Other than that – we’re twins! I bet mauve lip color would look good on you! Speaking of Jason Momoa, I ordered Atlantis Season 5. It ships on Tuesday. Barnes and Noble had a special, buy 2 DVDs and get a 3rd free. So I ordered Season 5, Season 1, and “Learning Spanish with Paco”. When I tried to redeem the 3rd DVD free deal, of course they screwed me with the ole “your order does not quailify” crap. So I’m not going to learn spanish just yet. Yep, thats right, I did not have the 1st season of Atlantis. Any guesses why?? Anyone? Anyone? No Ronon in season one!! I have seen all the episodes on TV. They are good, just no Ronon. And, I thought the full 5 set DVDs would sell better in the garage sale. Just kidding!! Too hot for a garage sale. I also ordered “The Speed of Dark”, so I will be on board with that. I just hope my crazy beagle puppy lets me read it. She’s mean! Her sweet looks are deceiving. And she has some ears that rival Lulu’s. It they stood up like Lulu’s, they would block the sun! I feel for you falling off the program. Tonight I managed to cook up some chocolate souffles that seemed to go over well with the gang at work. Next week is more ambitious, with a three course crepe meal in the works. All because of your pictures and food descriptions sparking an interest in cooking for me. I’ll let you know when I decide if you’ve done me a service or cursed me. Thanks for the mailbag. With Universe starting in a bit over 3 months, I hope TPTB will find the time to greenlight the tv movies. Such an action will go a long way to inspiring myself,and possibly others, into following the new series with the loyalty we’ve shown the other shows. As for the quizes/surveys.Shopping? lip gloss? Victoria’s Secret? Enough to send me shrieking away without bothering to click on the links. Anyways, good to see that they figured you you are in fact a man of taste when it comes to clothing. As always, thanks for the daily dose of blogging. It’s been said that Stargate Universe won’t have a big, dominating race of villains like the Goa’uld or the Wraith. Will universe at least have some recurring villains, be they species, small, groups, or individuals, even if each villain is only around for a few episodes? Mmmm, I love both of those Greek desserts. I hate sesame seeds on anything but those dough balls. YUM. I am amused by your Victoria’s Secret results. What *is* your favorite type of lingerie, then? No, I know. It’s the bikini. Hi – we took your recommendation and had dinner at Fuel tonight. It was amazing! Hahaha, I just saw a commercial advertising the AltarBoyz. Anyways, thank you for answering my questions! I can’t wait to read more about the cast! I also can’t wait to get more info about the show via Comic Con; it’s gonna be pretty awesome. Not only will we get some answers from Brad and Rob (or at least, vague hints), but we’ll also get our first taste of the cast’s chemistry with each other! Hopefully they’ll also have a teaser for the show to show. 1. Is episode 19 called “Duel”? 2. Is episode 19 called “Subversion”? I think they all have a chance. Hey! 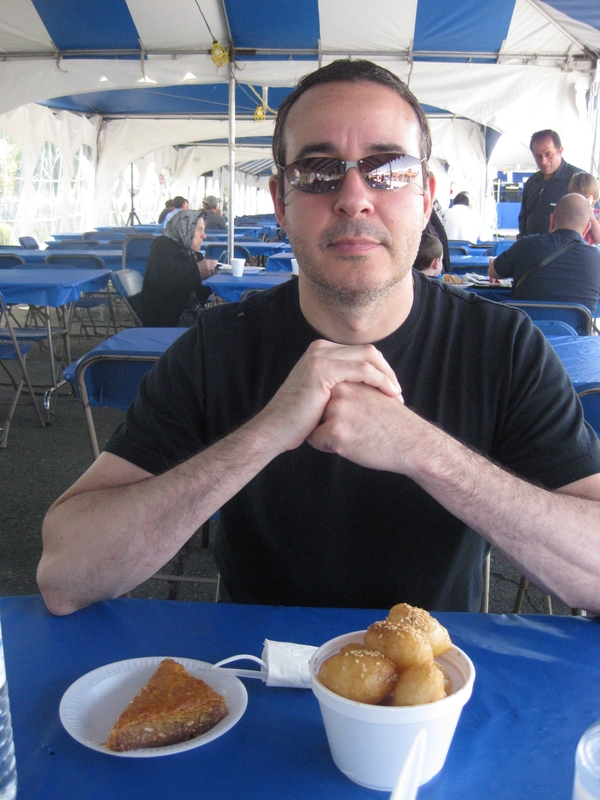 i was just there today in the afternoon with my family enjoying the good food they have at the greek summer festival. i had a gyro for lunch and afterwards we tried all three of the desserts and i couldn’t decide which one was the best. the bougaste (sp?) was pretty good though-we finished it off first. As far as the lamp is concerned, why didn’t you treat us with a photo? Or was it gone fast? Oh, and for your next visit there, the best way to eat the lamp is with a decent Tzatziki. As a die hard fan of science fiction and cooking food, for all of the above mentioned food, (deserts included) it will be my greatest pleasure to give you the recipes. So don’t hesitate to contact me for the recipes the original greek way! I’d like to feel smug because I didn’t think your dietary self-denial would last very long, but I empathize with you too much: food restrictions are hard, and compensatory exercise can be a bummer. — Uh-oh, self-pity. Time to go shopping! — Nah, not really a shopping diva; but when I do go, I enjoy it. Your Blogthing results were funny. I can just picture you talking bras over a salad niçoise with Laetitia Casta. If you’re like any other guy in that scenario — and I’d bet my clothes budget you would be — she’d be chatting away about various types and what they do for her (demonstrating as needed), and you’d politely agree when indicated while resorting more and more to mopping your brow with your handkerchief, then with kitchen towels brought by a thoughtful server. But actually being like Casta? I must be missing something deeply metaphysical here. I’ll think about it when I’m done laughing. Ok, here goes my answers……. Thanks heaps Joe. I love a good quiz. Maybe when you’re bored you could come up with one we could all do….what Stargate writer are you? So…. what’s your workout routine to burn off half a kilo of lamb and all that baklava?? Any chance of getting a shot of the new gate? I missed Greek Fest this weekend Now I’m wishing I would have made the extra effort to squeeze in just a quick run in for food! I can respect that of the actors, I don’t particulary like my pic taken unless I’m looking my best. That’s cool of you Joe with getting an ok from the actors to take pics and post them, my own family isn’t that considerate. Of course I think fans just wanna see them no matter how they look, but I can appreciate them wanting a voice. …And we all know who’s silly. Tarpon Springs is the Greek enclave around here, always some great food to be had. Hmm, I think I’ll have a gyro today. Hey Joe, I’ve got a writing/production questing that I hope you can answer. It’s been bugging me for a while and you’re the only one I know of that takes questions like this. Hypothetical situation: Character A has been a loyal member of organization B during their long tenure on the show. After several years as a loyal organization B member, the writers want to introduce a storyline where character A is revealed to have been a spy all along for opposing organization C. My question is this: Is actor A consulted on this character change? I really hope you respond to this. It’s been driving me nuts.